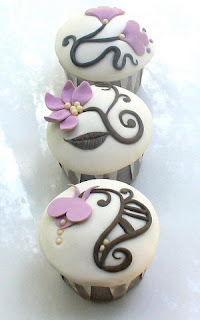 Deesigns by Nina Dee: Time for Cupcakes! Are you ready for another Cupcake Inspirations challenge? This week's challenge is sponsored by Phindy's Place. These cupcakes from Sugar Bloom Cupcakes are just beautiful. I hope you'll play along! I just love these colors together! I started with a Pale Plum card base and added an Early Espresso mat underneath a piece of Bella Bleu DSP. I stamped my sentiment from PTI's Signature Greetings set, then added a pleated Early Espresson Satin Ribbon. To finish off my card, I added a Pale Plum Scallop Circle flower with a creamy yellow button from my stash. Enjoy! OMGoodness... what a GReat card! It goes soooo well with the inspiration photo! And I love how you 'ruffled' the ribbon! Ni-ice job! Very pretty. Love the pleated ribbon (I have trouble trying to pleat ribbon) and how you used the yellow for your background. After you pleat your ribbon, is it wrapped around the back or is it only on the front? Love your deesigns. Your cards are always so classy! Love the ribbon treatment and the flower! Stunning!